Browse the latest Scentsy catalog featuring entire Scentsy home fragrance product line. The latest catalog displays some of the most unique and trendy home authentic Scentsy flameless candles & fragrance products ever. We love the new products and we’re sure you’ll be thrilled with what you find! When are the New Scentsy Catalogs Issued? Typically, the Scentsy catalog is issued twice a year, once during the fall-winter season and again for spring-summer. Always keep your eye out for the catalog issue dates, because the preceding month before the new catalog issue is when Scentsy offers special deals on almost all Scentsy products. Usually, you’ll find products priced at at least 10% off, so it’s always a good idea to keep up with the latest Scentsy news. 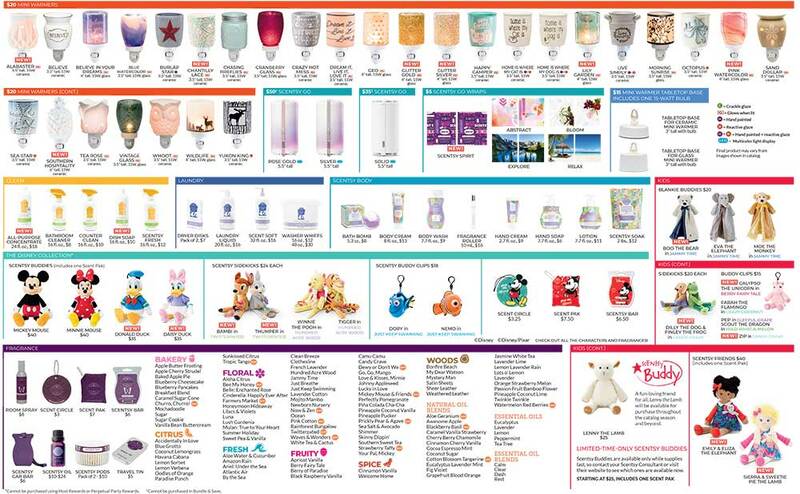 The latest Scentsy catalog is down below but here's a quick list of the general product categories of what you can expect to find. 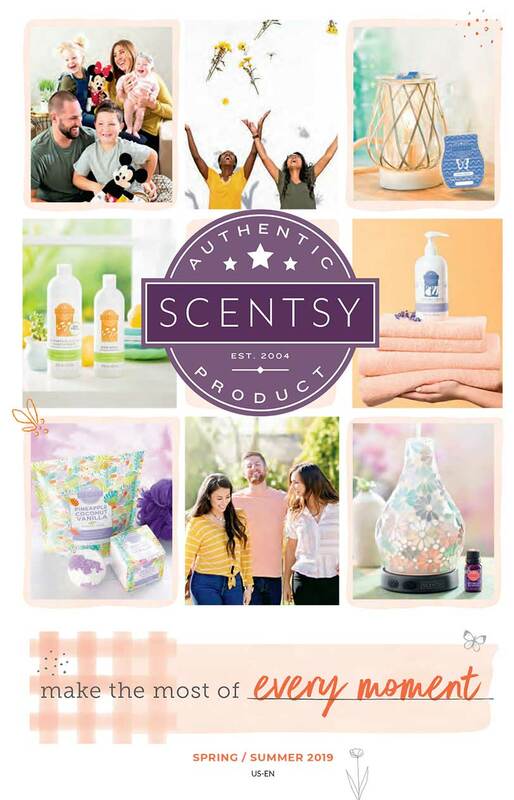 The catalog shown below is the Scentsy 2019 Spring/Summer Catalog. Candle warmers available in various sizes and types. Some with light bulbs and some without. Scentsy Bars, also known as scented wax melts. Many fragrances to choose from. Nebulizer diffusers and essential oils. Scent Circles and Car Bars to keep you car smelling aromatic! Scentsy Buddies and more Scentsy products for kids! Perfumes and more skin products. There are also grooming products for men! Scented soaps, cream, laundry detergents you'll love dryer disks! Nowadays, Scentsy does NOT show every single product in the catalog. We suspect it would make it way too long, so be sure to see the available products right here in our shop. At the bottom of each product category there will be a link to see all products for any given category. Should you have any questions please feel free to contact Scentsy Independent Consultant Mary Gregory at 661-210-7617! What's NOT Shown in the Catalog? The catalog usually does not show the most recent but temporary product collections. Often, in between catalogs, Scentsy comes out with new collections based on seasonal offerings or holidays. Then, each month we have a new warmer and scent of the month, so it's just not possible to include these offering within the catalog. If you are as passionate about Scentsy as we are, you might be interested in keeping up with all the products and learn of my specials by signing up for our newsletter. Unless there's a big Flash Sale, we only send out the newsletter once a month and we will NEVER spam you or share your contact info with ANYONE! Sign up for our monthly newsletter to receive information about special sales, promotions and discover the latest warmer and scent of the month.Be advised, your contact information is safe and we never share your info with anyone! You will NOT receive any other notifications except the monthly newsletter you are signing up for. Also, you might like the Scentsy warmer List. The image is intended to be an extra wide page, so it does not display so well after shrinking down to fit on this web page. 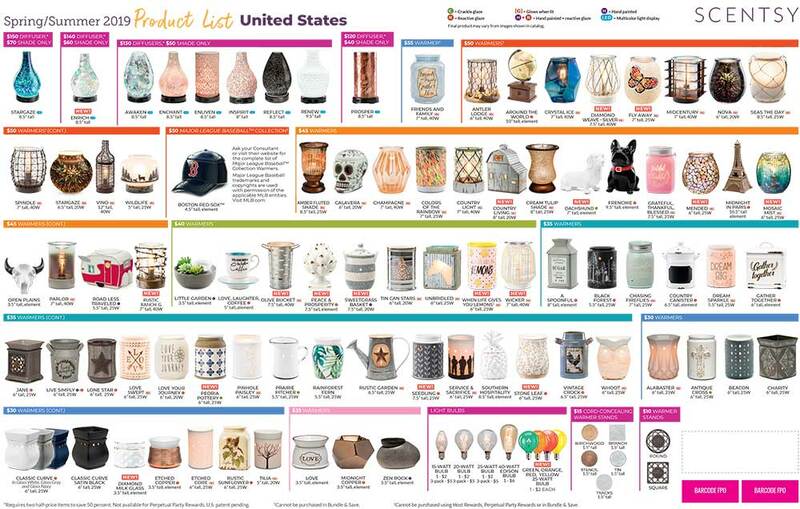 Still you can see the products and if you find something interesting you can always look it up further in the full size Scentsy product catalog by tapping or clicking on the image or link above. The adjacent video explains how the Scentsy Product Catalogs are developed and produced. Scentsy Vice President of Communications, John Curtis takes us through the creative process and technologies involved to bring us our bi-annual catalogs. I must say, as a consultant all the Scentsy catalogs I've even seen are really appealing and I'm always happy to hand them out freely to my customers.